"Carrots are sauteed in olive oil, and then briefly tossed with balsamic vinegar and brown sugar in this deceptively simple side dish." 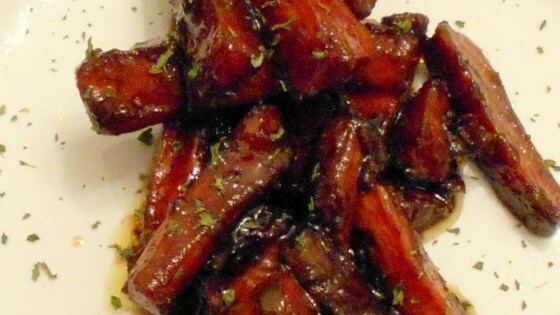 Fresh carrots cooked in a brown sugar glaze. Yummy way to cook carrots. However, they need to be steamed first for a little...ten minutes is not enough time in the skillet. I'm surprised I haven't reviewed these already. These have become a family favorite. We just love them. I've also used this method with sweet potato chunks. Thanks!